Made new steering arms for the Milan. 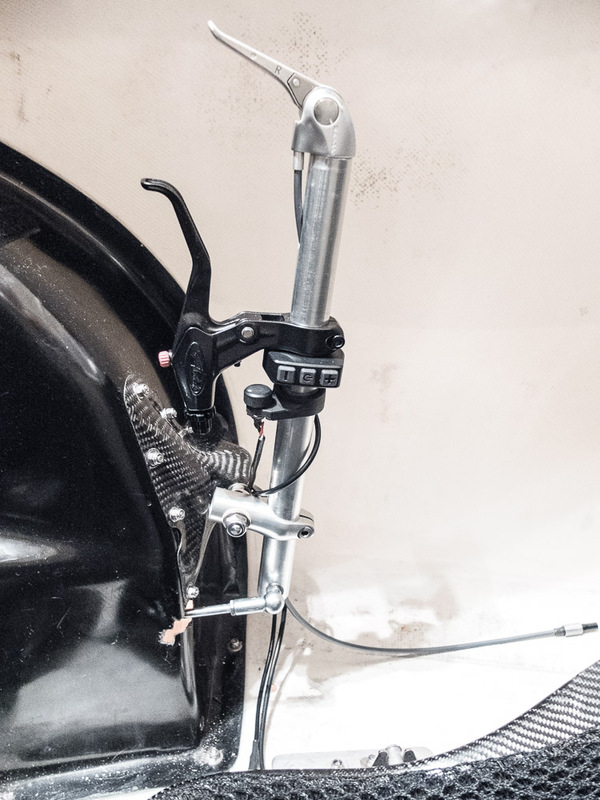 The original steering arms looked rather ratty and where too close to the wheel wells to provide enough space for the brake levers. I simply cut down two bar ends and drilled holes for the plain bearings. The actual levers are two length of 22mm aluminum tube and go into the (former) bar ends. If I ever get the idea I absolutely need carbon fiber steering arms, I only have to swap the aluminum tubes for CFK tubes. 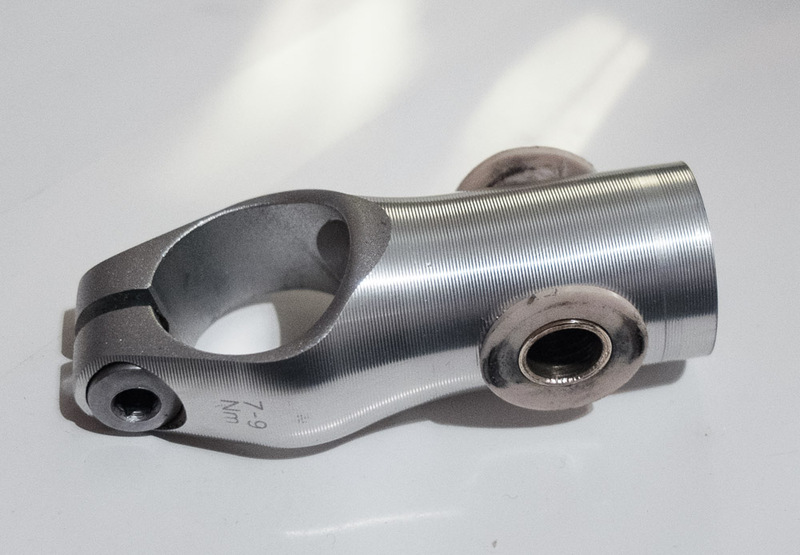 DIY steering arm clamp with plain bearing made from a bar end (27g). Not sure which function to assign to which momentary switch. Also, I still have to install the Tripwire switches to the brake levers. Mick van Bit posted a documentation about the developement of the Milan on his website. I met Eggert Bülk, the designer of the Milan velomobile, last year and had a small chat. The old rear shocks of the Milan are worn and actually not working that great anyway, since they offer no proper damping. Riding the Milan across cobblestone was ‘interesting’, to say the least. Hence, I’ve ripped them out and build new rear shocks with elastomere’s. On top, one of the old, original, rear shocks. The carbon fiber tubes are much prettier. To keep it simple, the new shock is just a 22mm CFK-tube with an aluminum plug on one end, a PTFE (Teflon) bushing at the other and a 10mm stainless steel precision tube with M8 threads for the rod-end bearings and the ‘piston’ (a M8 countersunk screw). 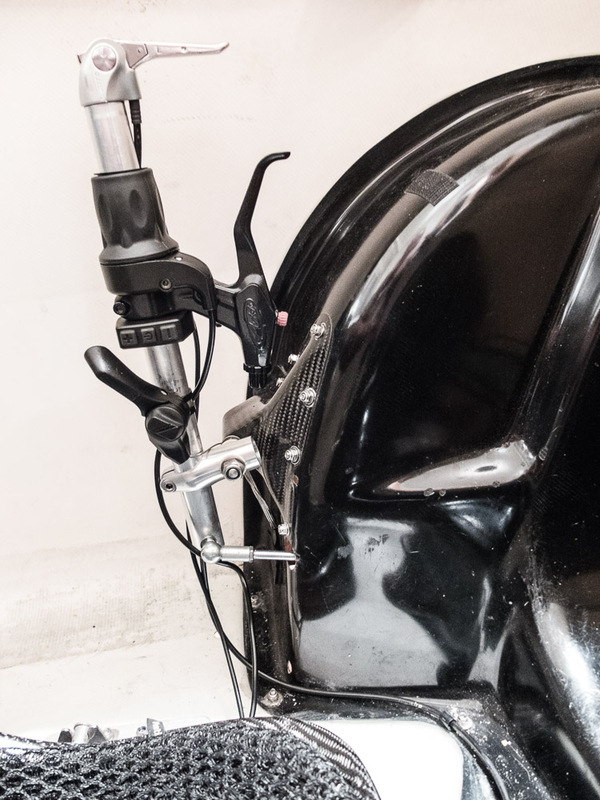 The elastomere are used, ‘soft’, ICE Trikes elastomere (for their front suspension), cut to length. I’ve put a small lens head screw in the flat side of the elastomere, that will lock into the hexagonal hole of the M8 countersunk screw (the ‘piston’), to provide it with some guidance against scraping at the CFK-tube. If that doesn’t work, I’ll have to put a Nylon washer between M8 screw and piston rod. Since the Milan is more or less ripped to pieces, a test ride has to wait till its roadworthy again.